Send a special message to your friends and family with these personalized glass jar wedding favor. 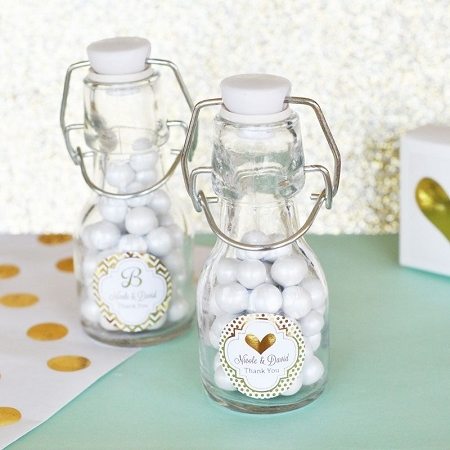 These unique jars include customizable gold foil labels Fill these charming little favors with thank you notes and poems or edible favorites from mints to jelly beans, or both! 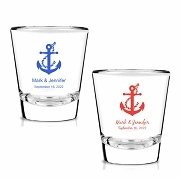 Our shining personalized labels make these one of a kind bottles that won't get lost at sea. 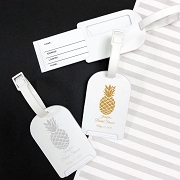 Along with your notes and goodies, our personalized labels allow you to add names and dates to your bottles to make them memorable keepsakes for your guests to keep for years to come and refill with candies and trinkets of their choice. 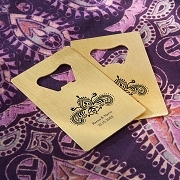 These are ideal favors that thank your guests for coming in a new classy and unique style. Size: 4.25" x 1.5"x 0.69"